Filter, Group, Aggregate and Sort You can filter, group, aggregate and sort your visualization without the use of formulas. 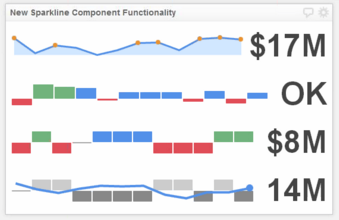 Using the More Actions menu allows you to apply these actions directly in your visualization. See the More Actions article to learn how to use these actions with elements of your components and Hidden Data. You can also set a tooltip format, range, decimal places, separators, prefix and suffix on a sparkbar chart. Note: If your data includes a value that is outside the minimum and maximum range you set, that value will still display in your Klip. From the Data panel, formula editing toolbar, build a formula similar to ARRAY( 12 , 14 , 8 ).